Matthew Kangas, “Appreciation: Alden Mason (1919-2013),” art ltd, May 2013. Sheila Farr, “A Knockout Tribute to Alden Mason at Wright Exhibition Space,” Seattle Met, April 30, 2013. Michael Upchurch, “Alden Mason’s Energy Glows in Museum-Worthy Retrospective at Wright Space,” The Seattle Times, April 2013. Jen Graves, “Alden Mason Has Died,” The Stranger, February 7, 2013. Lynda V. Mapes, “Obituary: Alden Mason, 93, Lived, Painted With a Flourish,” The Seattle Times, February 7, 2013. Sheila Farr, “Remembering Alden Mason (1919-2013),” Seattle Met, February 6, 2013. Jen Graves, “Obsessive, Crawling, Joyful: The Five Decades of Alden Mason,” The Stranger, March 28, 2012. Suzanna Parikh, “A Lifetime of Art,” The Daily of the University of Washington, July 27, 2011. “Washington State Dismantles Mural,” New York Times, December 10, 2010. Regina Hackett, “Alden Mason – To Live in a Brighter World,” Another Bouncing Ball (blog), December, 1, 2010. Nancy Worssam, “Exhibition Review: ‘Endless Flirting on Paper’,” The Seattle Times, April 18, 2010. Gayle Clemans, “Playgrounds for Memory, Intuition,” The Seattle Times, March 15, 2009. Jen Graves, “The 25 Greatest Works of Art Ever Made in Seattle (In No Particular Order),” The Stranger, March 3, 2009. Kiera Scholten, “Alden Mason,” Artworks Magazine, 2009. Jen Graves, “In Art News: Assortment,” The Stranger, October 30, 2008. Sheila Farr, “Seattle Art Dealers Pitch a Winning Show in ‘Century 21′”, The Seattle Times, October 17, 2008. Jefferson Robbins, “The Artist’s Dilemma,” The Wenatchee World, September 19-25, 2008. Regina Hackett, “‘Dealer’s Choice’ Shifts the Rules,” Seattle Post-Intelligencer, September, 23, 2008. Matthew Kangas, “Alden Mason: ‘Burpee Garden Paintings’ at Greg Kucera Gallery and ‘Paintings and the Whole Rigmarole’ at Foster/White Gallery,” art ltd, May 2008. Gale Clemans, “Pleasing Visits with Two Northwest Greats,” The Seattle Times, March 21, 2008. Regina Hackett, “At 88, Painter Still Surprises Himself,” Seattle Post-Intelligencer, March 5, 2008. Regina Hackett, “Alden Mason and the Devil in the Bushes,” Seattle Post-Intelligencer, August 21, 2007. Reiko Sundahl, “West Coast Funk and … Alden Mason, ” Art Dish (blog), August 19, 2007. Andrew Engelson, “Visual Arts Pick: Alden Mason,” Seattle Weekly, September 2004. Matthew Kangas, “Exhibits Show Discipline Underlying Abstract Art,” The Seattle Times, September 10, 2004. Regina Hackett, “Alden Mason’s Soul Only Grows More Confident,” Seattle Post-Intelligencer, 2004. Regina Hackett, “New Alden Mason Works Take a Startling Step Into the Shadows,” Seattle Post-Intelligencer, January 2, 2001. 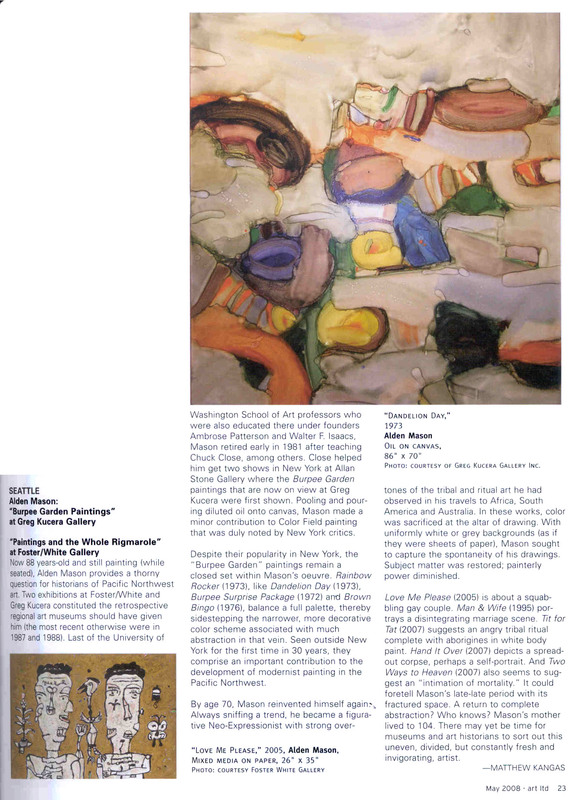 “College’s commissioned art spans three decades,” Blue and Gold, April-May, 2000. Regina Hackett, “Modern Exhibit Avoids Old Quarrel,” Seattle Post-Intelligencer, October 26, 1999. Robin Updike, “Engaging Show Recaps the History of Modern Art in the Northwest,” The Seattle Times, October 21, 1999. “Alden Mason at Greg Kucera,” Art in America, March 1996. 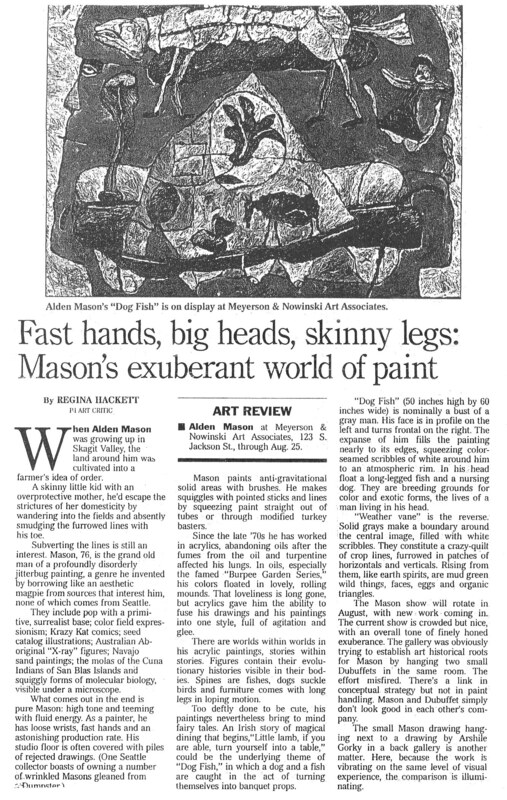 Regina Hackett, “Fast Hands, Big Heads, Skinny Legs: Mason’s Exuberant World of Paint,” Seattle Post-Intelligencer, 1996. Robin Updike, “Inside Alden Mason’s Head,” The Seattle Times, September 28, 1995. Regina Hackett, “All Paths Lead to Bountiful Nature at Greg Kucera Gallery, Seattle Post-Intelligencer, September 8, 1995. Jeanette Ross, “Outside Alden Mason At Boise Art Museum,” Art Week, October 20, 1994. S. Duda, “Jarring Masons’,” Boise Weekly, August 25-31, 1994. Regina Hackett, “Some Collectors Go Beyond Buying, Begging, Borrowing,” Seattle Post-Intelligencer, December 17, 1990. Elizabeth Bryant, “Art Works for AIDS Contributes to Healing Process,” Seattle Post-Intelligencer, November 30, 1990. Deloris Tarzan Ament, “Decisions On Murals Upset Both Sides,” The Seattle Times, September 28,1990. Regina Hackett, “Be-bopper Alden Mason Paints His Canvas with Rhythm and Hues,” Seattle Post-Intelligencer, September 19, 1990. Bruce Barcott, “A Place For Art,” Seattle Weekly, September 5, 1990. Karen Mathieson, “Mason Paints Images that Seem to be Alive,” Seattle Times, September 15, 1990. Chris Bruce, “Precious Time and Money Spent Belittling Achievements,” Letters to the Editor, Seattle Post-Intelligencer, date unknown. Deloris Tarzan, “Hercules Art Spurs A Test of Strength,” Seattle Times, date unknown. Regina Hackett, “Get A Glimpse of the Capitol Murals Before They’re Taken Away,” Seattle Post-Intelligencer, July 4, 1989. 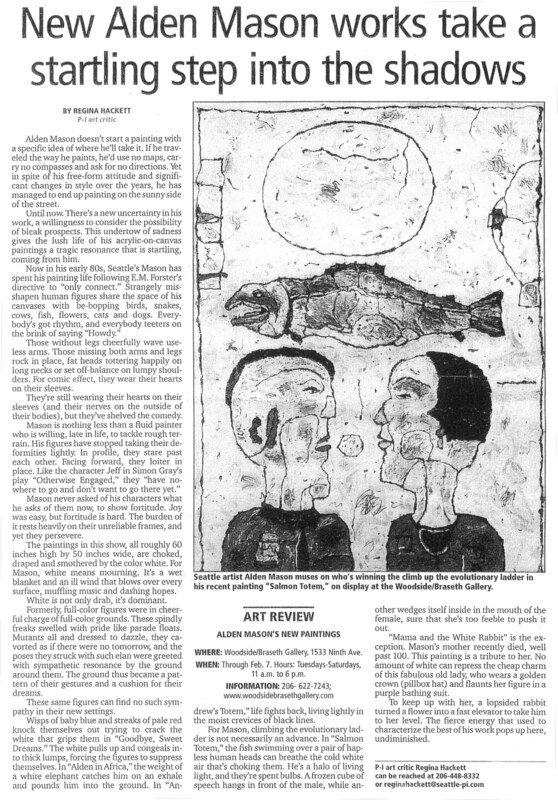 Regina Hackett, “Mason’s Pop-Tinged Works Span the Worlds of Surrealism and Native Art,” Seattle Post-Intelligencer, March 15, 1989. Debra Cassens Moss, “Mural, Mural, on the Wall,” ABA Journal, February 1, 1988. “Alden Mason, A Cheery Neo-Expressionist,” The Weekly, November 1987. Deloris Tarzan, “Fund Will Fight Mural Removal,” Seattle Times, April 10, 1987. Regina Hackett, “Growing Old or Up Isn’t for Alden Mason,” Seattle Post-Intelligencer, March 6, 1986. Visual Arts Column. Seattle Post-Intelligencer, February 28-March 6, 1986. Deloris Tarzan, “Drawings Move To Their Own Beat,” Seattle Times, 1986. Regina Hackett, “Decorations Can Be Art, Too,” Seattle Post-Intelligencer, February 1, 1984. Deloris Tarzan, “Dollops and Squirts Come To Life,” Seattle Times, January 28, 1984. LaMar Harrington, Smithsonian Archives of American Art, January 13, 1984. Deloris Tarzan, “Mason Makes a Painful Transition,” January 1978. R. M. Campbell, “Alden Mason’s Puzzling, Satisfying Paintings,” Seattle Post-Intelligencer, October 12, 1975. Alfred Frankenstein, “Brilliant Colors and Raw Fury,” San Francisco Chronicle, March 1, 1975. Regina Hackett, “Alden Mason: Magic Landscapes and Unknown Dreams,” Currânt Magazine, 1976. Joan Lowndes, The Province, May 16, 1969.